This project will reduce the illegal capture and trade of wild and captive elephants through the registration and micro-chipping of captive elephants. To date the team has successfully micro-chipped 442 elephants. This project will also include the distribution of Elephant Identity Cards, training of mahouts in basic healthcare, and the dissemination of information within mahout communities promoting long term care, breeding opportunities, and a socio-economic alternative to logging. Without effective conservation the Lao PDR risks permanently losing both wild and captive elephant populations. The interrelationship between wild and captive elephants in Laos is still significant, and whilst captive populations are declining the demand for working elephants within logging and tourism sectors is increasing and thus the temptation to illegally capture and tame wild elephant populations is intensified. There is also the risk of illegal export of live elephants to neighbouring countries which threatens the sustainability of the captive population in Laos. 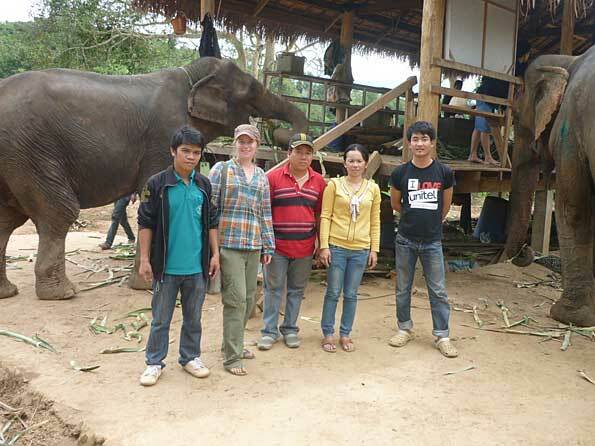 In collaboration with the Department of Livestock and Fisheries (DLF), ElefantAsia implements the Lao Captive Elephant Care and Management Programme (LECMP) administering free veterinary healthcare to captive elephants in Laos as well as facilitating the registration and micro-chipping of this core population. Activities conducted under the LECMP for the previous six years have worked to facilitate capacity building within the DLF empowering the government agency to implement future care and management of elephants in Laos. ElefantAsia seeks to strengthen further registration process to diminish the risk of illegal capture and trade of wild and captive elephants in Laos, whilst building capacity within the DLF to assist the LECMP becoming fully autonomic. Establishment of the decree in Management of Domesticated Elephants not only provides working rights to mahouts and their elephants, but clear regulations on registration and enforcement. Provision of elephant identity cards provides official documentation which is both difficult to forge and falsify whilst also recording information pertinent to each individual elephant such as photograph; micro-chip number; appearance; characteristics; owner validation and health checks. The introduction of elephant ID cards in Laos will diminish the risk of illegal trade and export in wild and captive elephant populations whilst easing registration process and empowering officials to enforce the law relating to elephant ownership. A system of Elephant Identity Cards has been implemented in range countries such as Thailand and India5 to reduce the risk of illegal capture and poaching from the wild and illegal movement. Thailand is currently moving towards upgrading its current Elephant ID card system with submission of a proposal to the Interior Ministry requesting documentation include regularly updated photographs and embedded microchips. The Elephant Identity Cards used in Laos are of uniformed design, each containing the elephant’s unique micro-chip number; recent photograph; physical characteristics. The ID card is intended to ease identification of each captive elephants in Laos; reduce the use of fraudulent registration papers; aid officials not always familiar with these animals. 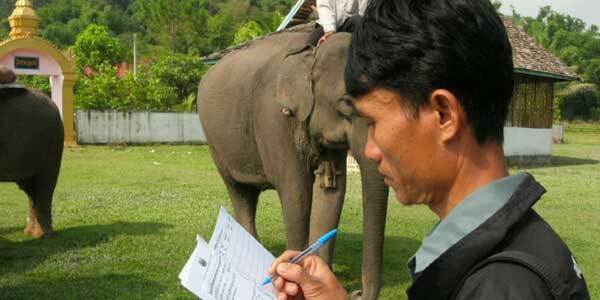 The ID cards also detail elephant origin and owner’s details and record health checks. The Elephant Identity Cards must be validated periodically and transfer of ownership registered by District officials allowing the national database kept up-to-date, whilst recorded medical history is invaluable for future diagnosis and treatment. The Elephant Identity Card must be carried by a mahout with his elephant at all times. AVID microchip scanners have been recognized compatible with our former equipment and effective in the Lao field by the ground staff. They enable a quick and efficient detection of elephant microchips, We purchased one scanner from AVID microchip company, located in the USA, in June 2013. DLF and ElefantAsia undertook a consultation process to establish proper registration system regarding the management of captive elephants in Lao PDR. The process included the organization of a workshop from 4th to 7th of November 2012 in Sayaboury province with participants from local livestock authorities (districts of Paklay, Sayaboury, Hongsa, Ngeun), 3 representatives from the provincial Livestock Department and 3 representatives from the central level (Department of Livestock and Fisheries). The objective of this workshop was to collect comments, review and field experiences from district and province livestock officials. At this occasion, the full process was presented and discussed by meeting participants. Participants also discussed and reviewed in detail the content of each administrative forms designed for the project as well as the implementation process of ID cards. Comments from the field were submitted to the central level and reviewed by officials from Livestock Department in charge of planning and legal documents. With technical support from ElefantAsia, several discussions between all stakeholders took place and, the Director of the Livestock Department endorsed the new registration process. The full registration process including related administrative forms and ID Books are attached in appendixes. The ID Books have finally been printed in Vientiane beginning of June 2013. On August 1st 2013, a workshop was organized in Sayaboury Province with 2 representatives from each district (Paklay, Kenthao, Bortene, Thongmixay, Xienghone, Khop, Phieng, Sayaboury, Hongsa, Ngeun) 3 representatives from the provincial Livestock department and 2 representatives from the central level (Department of Livestock and Fisheries). At this occasion, 22 people were trained to the new registration process. Finally the process of reviewing and endorsing the new registration rules took a long time as we want this new regulation process to comply with the general law on livestock management in Laos but also match with the specific situation of elephants in Lao PDR and field conditions. During the veterinary missions, we conducted training sessions at DLF district offices. We trained the key staff members, identified by DLF and NAHC, to issue new registration documentation and enforcement of the new regulations, by providing interactive instructions and practical training in Lao language. Officers need to fully understand procedures and registration to enforce the regulation effectively. This training was done at the occasion of each field mission organized since February 2013. The LECMP mobile veterinary units started to issue elephants ID cards as a pilot in order to train the livestock officials during their field missions and the Elephant festival (February 2014). Each working elephant will soon be issued an identification card containing the elephant’s unique micro-chip number; recent photograph and physical characteristics. The cards also details elephant origin and owner’s details and record health checks. The elephant identification cards must be validated periodically and transfer of ownership registered by district officials allowing appropriate updating of national database, whilst recording medical history is invaluable for future diagnosis and treatment. The identification card must be carried by a mahout with his elephant at all times. The ID book design is attached in appendix. DLF and NAHC staff undertook field missions with the Mobile Veterinary Unit. On each mission, mahouts were informed about the new registration process and introduced to the different forms issued in Lao language (attached in appendix). Copies of these forms are available in the district offices. The national database is updated by the ground staff (Mrs Vathsana Chanthavong) on every mission. Any change in ownership, owner information, medical or breeding history is registered on field notes and added to the database. The ID book forms help collecting more detailed information and make it available to district officials, and mahouts. The database information is regularly checked by EA staff (Ms Emmanuelle Chave, head veterinarian) to ensure information accuracy and reliability. DLF and local authorities took a lot of time to start issuing the ID cards on the fields. Finally the first ID cards were distributed in Champassak province, in the south of the country. This province was before hosting many elephants but they are only 26 left in the province. However local authorities show a strong commitment to protect their last elephants. For that reason, the project was welcomed in this province. Until Champassak province compile with this new regulation, it was easier to convince Sayaboury province, where most of elephants are living. However it took an additional 6 months to start. Mrs Vathsana Chanthavong has been working with EA for the past 6 years, she is completely autonomous on most of the field missions skills (information collection for database, deworming, treatments of most of the classical pathologies, mahouts training on basic health care and new registration) She also organizes the routine missions, contacting the district officials and producing the authorization papers. She fills the national database, and updates LECMP accounting under EA staff supervision. However, Mrs Chanthavong has been on a maternity leave this year, since September 2013. She kept on organizing the missions and filling the database, but has been replaced on the field by a DLF official, Mr Anousone Fongmany. Given the situation, we decided to keep supervising and helping on funding LECMP project this year. Mrs Chanthavong came back in june 2014 from her maternity leave and Mr Anousone Fongmany is still participating in the field missions, in order to have at least two completely trained staff in the future. Since February 2013 our team of veterinarians and livestock officials checked a total of 223 elephants. Out of this number, 13 elephants were still not registered. An electronic microchip was injected in all of them and their bio-data and ownership details were registered in the Lao database. Following a national workshop, where the decree was initially discussed by all stakeholders with ElefantAsia technical support, the new registration process was endorsed by the director of the livestock department in November 2012. Since then, the provincial levels where reluctant to implement the new system, until Champassak and Sayaboury agree. At the occasion of a second meeting in August 2013, 22 officials were trained to the new registration process. In each of the 11 districts visited this year (Paklai, Sayaboury, Thongmyxay, Champassak, Hongsa, Ngeun, Phieng, Botene, Khop/Xianghon, Pakbeng, Luang Prabang) by the LECMP team, district officers were introduced to the new registration process in Lao language by Mrs Chanthavong and Mr Fongmany, and trained to issue the ID cards. Following the consultation process, the ID cards were printed in Vientiane in June 2013. They started to be issued by the district officers as a test, part of their training. As several administrative levels (village, district, province, DLF) are involved in the ID cards issuement, it took us longer than expected to establish the proper administrative forms between all the different levels. The ID cards distribution is still ongoing, and will probably need a few months more. We start to issue the ID cards with the district officers during the field missions, but then they have to complete all the administrative papers, as a link between the different administrative levels, which is time consuming. The national database is updated after each field missions under the regular supervision of ElefantAsia’s head veterinarian. To date, 514 elephants are registered, and 494 are microchipped. We regularly conduct small meetings with the mahouts, before each mission, on a specific, basic, health issue. 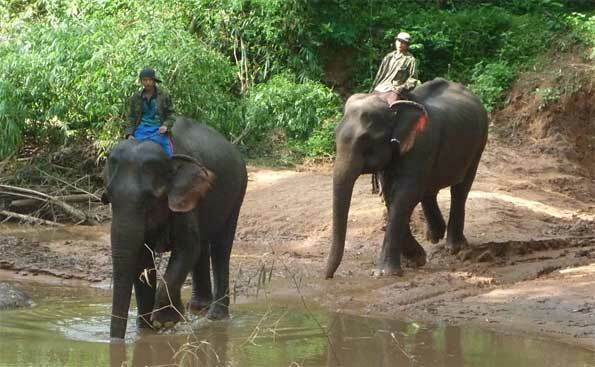 This year, 223 mahouts were informed about the zoonotic risk of elephant tuberculosis. Every mahout is trained on basic wound and abscess treatment, as well as advised on nutrition or reproduction if necessary. During field missions, mahouts are given the elephant hospital business card, with a phone number to contact the veterinary team in case of emergency, presented in Lao language. Moreover, the elephants that need long term treatment are offered to be treated in the elephant hospital, in Sayaboury. ElefantAsia established two breeding areas, in Sayaboury and Champassak provinces, to provide breeding opportunities to the elephants, when the mahouts are interested. We have now 3 potentially pregnant females in Sayaboury, with siring having occurred in July and September 2013, and June 2014. Recently, the officials from Champassak reported another potentially successful mating. The new “Management of Domesticated Elephant decree”, including the new registration process was sucessfully endorsed and recognized significant by the Lao government officers. 22 district officers were introduced to the registration process and administrative documents in August, and 2 to 3 district representatives were trained on the field at the occasion of each of the 11 field missions conducted by LECMP team. Given the several administrative levels involved in the ID cards issuement and the specific administrative paperworks that are therefore needed, the ID cards distribution was delayed and we didn’t fulfilled the initial objective of the year. Less than half of the cards were distributed and some district need more authorization letters from the central level. However the process is now ongoing and should be achieved within the next missions. LECMP activities were continuously monitored this year. The field missions organization, technical skills, update of the database and accounting were completely delegated to the key DLF person, Mrs Vathsana Chathavong, under the supervision of ElefantAsia head veterinarian and funders. Given that Mrs Chanthavong was off for a maternity leave, we decided to postpone the full autonomisation of LECMP, and took advantage of the situation to train a second DLF person, Mr Anousone Fongmany. Mr Fongmany will undertake further training this year, supervised by Mrs Chanthavong, in order to have two Lao nationals, fully trained to ensure LECMP sustainability in the future. With financial and technical support from ElefantAsia, the Department of Livestock and Fisheries (DLF) currently implements the Lao Captive Elephant Care and Management Programme (LECMP) which facilitates the registration and micro-chipping of the Laos captive elephant population via Mobile Veterinary Clinics. This year ElefantAsia and DLF worked together to further strengthen registration, increasing capacity within government agencies to enforce enhanced registration process defined under new Lao decree “Management of Domesticated Elephants” and issuing individual elephant identification cards to the captive Asian elephant population in Laos. During an inceptive workshop organized from the 4th to the 7th of November 2012 in Sayaboury province, the new registration process, as well as the detailed contents of each administrative form, were discussed with local livestock authorities, with the technical support of ElefantAsia team. The director of the livestock department finally endorsed the new registration process. The ID Books were printed in Vientiane beginning of June 2013. On August 1st 2013, a meeting was organized in Sayaboury Province with 2 representatives from each district (Paklay, Kenthao, Bortene, Thongmixay, Xienghone, Khop, Phieng, Sayaboury, Hongsa, Ngeun) 3 representatives from the provincial Livestock department and 2 representatives from the central level (DLF). At this occasion, 22 people were trained to the new registration process. Out of this number, 13 elephants were newly registered and injected with an electronic microchip. The national database was updated by the ground staff after each mission. Any change in ownership, owner information, medical or breeding history was registered on field notes and added to the database. The database information was regularly checked by EA staff to ensure information accuracy and reliability. For each mission, half a day was used to conduct training sessions at DLF district offices. We trained the key staff members, to issue new registration documentation and enforcement of the new regulations, by providing interactive instructions and practical training in Lao language. We started to issue elephants ID cards as a test in order to train the livestock officials during their field missions. The ID cards distribution is still ongoing. Each working elephant will soon be issued an identification card containing the elephant’s unique micro-chip number; recent photograph and physical characteristics. The cards also details elephant origin and owner’s details and record health checks. The elephant identification cards must be validated periodically by district officials allowing appropriate updating of national database. The identification card must be carried by a mahout with his elephant at all times. Mahouts were informed about the new registration process and introduced to the different forms issued in Lao language. Copies of the decree are available in the district offices. This new registration process of captive elephant populations will diminish risk of illegal capture and trade in wild and captive elephants in Laos.